Although many people consider lucite the standard material for DealGifts, many are made of glass or crystal. Why Crystal? When a client wants a certain heft and shine, there’s nothing better than crystal– it is the embodiment of luxury. Also, 3D laser etching, an effect that allows us to replicate almost anything in dimension inside a clear block, can only be executed in crystal. 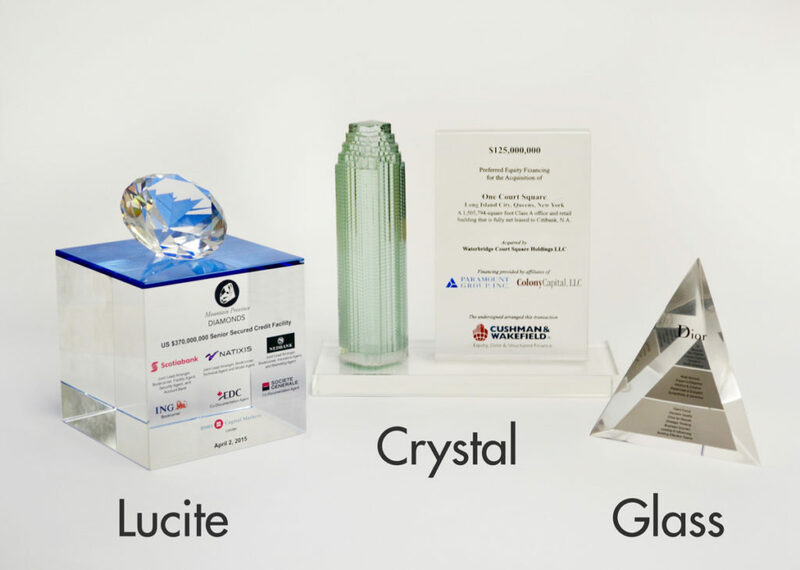 It is a more expensive and heavy option than either acrylic or glass, so it is ideal for big-budget items, like achievement awards. For an even more deluxe piece, a granite or marble base can be added to a crystal top. Why Glass? Glass is a great option if a client loves the cool feel of crystal but is on a more limited budget. Like lucite, glass can be etched, sandblasted and machined into almost any shape. Unlike Lucite, it cannot be molded. Glass plaques and bases are available in both custom and stock sizes and shapes so that many budgets and needs can be accommodated. Like crystal and Lucite, glass can be etched and sandblasted. Why Lucite? Lucite, or acrylic, is the most versatile of the three materials, because it can be molded and machined into virtually any shape. Almost any color, including Pantones, neons and even glow in the dark, can be created. Colors can be opaque or translucent, as well. Because it is poured into the mold in layers, it is possible to embed a wide variety of different materials within the Lucite to create interest and dimension. In addition, translucent, opaque and stone-effect layers can be combined in one piece. Think of a layer cake or a gelatin mold loaded with goodies and you’ll get the idea. Which material you use is a matter of taste, budget and what your project requires. We are happy to advise you on what will work best for your specific project.